p. 26: The modern conception of the Renaissance was shaped essentially by Jacob Burckhardt's 1860 study, The Civilization of the Renaissance in Italy. Burckhardt envisioned Renaissance men as rejecting the corporate values that had determined personal identity in the Middle Ages, and Renaissance women as enjoying a new equality with men. He characterized fifteenth-century Italy as the birthplace of modern individualism, often seen as literally represented in Renaissance portraits. In the last thirty years so so, feminist scholars have reappraised female experience in Renaissance Italy, as elsewhere. Gender is now generally viewed as a social construct as much as a biological given, and women as universally constructed in accordance with the male needs and ideals of the specific societies in which they lived. 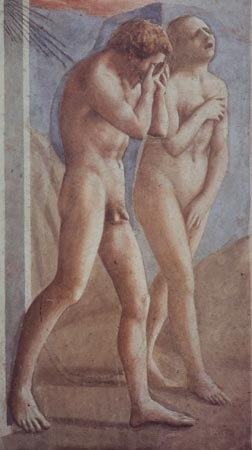 Art historians have reassessed the representation of women by male writers and artists of the Renaissance in the light of psychological insights derived from critical writing on the cinema, in which males are seen to assert power through the privileged subjective action of looking at females, the passive, powerless object of their controlling gaze, she the eternal "other" to his "self." Social historians, studying the structure and ideology of the male lineage and of the Florentine republic, have explored the social and legal constraints on women and demonstrated that female destiny was almost entirely in the hands of men; indeed, women had very limited rights and few opportunities for any autonomous action. They have also shown that, in fact, neither men nor women were free, as Burckhardt imagined, to fashion an individual self, a personal identity independent of the values and demands of a society still structured around the communities of family, state, and an all-pervasive Church. Their values determined the very different roles of men and women in a social scenario to which both sexes were committed. Portraits, like most Renaissance images, represent a complex amalgam of real and ideal, signified by idealized features and stylized attributes, in the presenation of a self as defined by society. "Don't be born a woman if you want your own way." This dictum of Nannina de' Medici, from a letter to her brother Lorenzo the Magnificent, written after an altercation with her father-in-law, Giovanni Rucellai, shortly after her marriage to his son Bernardo, holds true of even the most privileged of Florentine upper-class women.... Indeed, Florence was among the more unlucky places in Western Europe to be born a woman. In the princely courts a woman could inherit wealth and a measure of power with her noble blood, and her significance might then be as much dynastic as domestic, even political. In Florence, inheritance was through the male line only. The merchant republican society of that city was committed to communal, Christian, and classical values. These all prescribed that the honor of men should reside in their public image and service, and in the personal virtue of their wives; women were excluded from public life, and sequestered in the home to ensure their purity and that of the blood line through which property descended. In their portraits women appear framed in the windows of their houses. 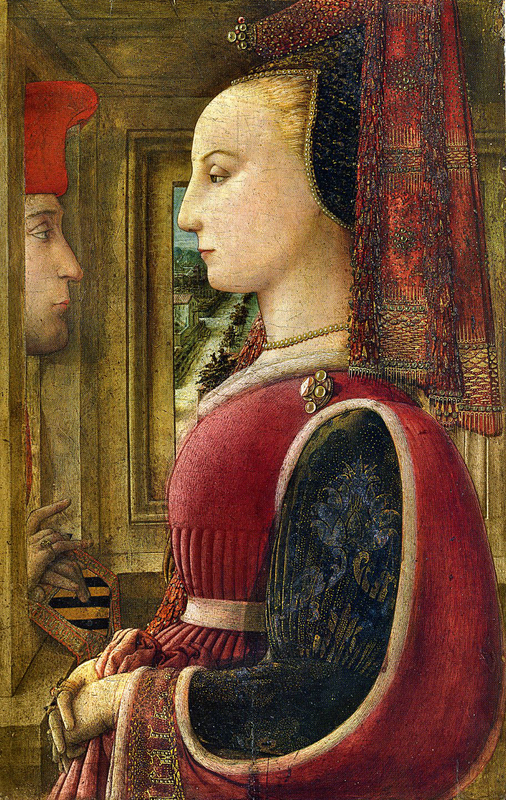 In 1610 a French traveler commented after a visit to Florence that "...women are more enclosed [here] than in any other part of Italy; they see the world only from the small openings in their windows...."
Historians are often hard put to rescue the testimony of women's experience from the silence imposed on them by the limitations of evidence produced largely by men. In Florence, the best documented society of early modern times, men restricted women's lives, but as almost obsessive record keepers kept account of them. In the words of Renaissance laws, tax returns, and sermons, as well as women's own letters and devotional writings, we may still hear something of their voices. Women's lives throughout Europe during the Middle Ages and Renaissance were strongly shaped by the ambivalent attitudes of a powerful Church whose moral prescriptions were enforced not only in the confessional, /p. 27: but also by the laws of the state. Eve was the villainess of Christian history, the cause of original sin and of man's Fall. God created her from Adam's rib, subordinate. But she was tempted by the serpent, and tempted Adam to sexual sin. Thus Everywoman dwelt in the shadow of the fallen Eve, justly sentenced to the pain of childbirth and the labor of motherhood. The stereotype of woman as Eve was that she was weak, foolish, sensual, and not to be trusted. Women were the scapegoats for the physical impulses that warred perpetually with the spiritual in men, a conflict sometimes depicted as an allegory of marriage. Self-disgust and revulsion against women are typically mingled in an adage of the humanist scholar Marsilio Ficino: "Women should be used like chamber pots: hidden away once a man has pissed in them." Devotional images depicted the Virgin Mary in roles which were the common lot of womankind: the Annunciation of her pregnancy, giving birth in the stable of the Nativity, the Madonna and Child, the infant cradled in his mother's arms, her grief at his death at the Crucifixion. These archetypal images framed society's views of real women, furnishing exemplars for their behavior. 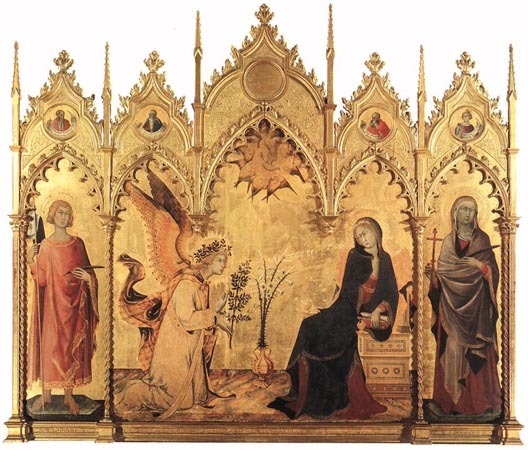 San Bernardino, the most popular of Tuscan preachers in the fifteenth century, enjoined his female listeners to model themselves on the Virgin as depicted in Simone Martini's Annunciation: "Have you seen that [Virgin] Annunciate that is in the Cathedral, at the altar of Sant' Ansano, next to the sacristy?... She seems to me to strike the most beautiful attitude, the most reverent and modest imaginable. Note that she does not look at the angel but is almost frightened. She knew that it was an angel.... What would she have done had it been a man! Take this as an example, you maidens." Marriage and the dowry system were the major determinants of female destiny. Rather than the consensual union of two individuals, marriage was a social and economic contract between families that answered to their interest and that of the state in replenishing a population threatened by recurring episodes of plague. 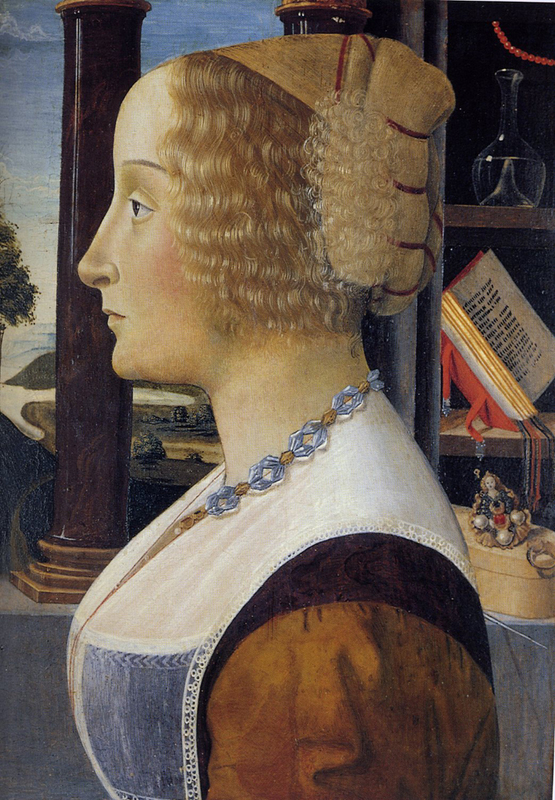 As Francesco Barbaro stressed in his famous treatise concerning wives presented to Cosimo de' Medici's brother Lorenzo when he married Ginevra Cavalcanti, the first duty of a man was to marry and increase his family. A woman's primary function was to serve as the vessel by which the lineage /p. 28: was maintained. A woman's secondary function was as the means of attaching to the lineage by marriage allies from other Florentine families with desirable attributes --wealth, nobility, and political influence; she acts as "a sort of social glue." A mid-fifteenth-century painted panel, probably to decorate a bedchamber, depicts the marriage procession in the public setting of the piazza of the Baptistery; the lily of Florence on the banners attached to the instruments of the accompanying musicians underscores the civic significance of the union. Elaborately dressed guests perform a dance, and preparations for a banquet are also visible. "Birds of passage" in a no-woman's land between the two male lineages to which they half belonged, women were caught between competing kinship strategies. At her husband's death a woman had either to return to her natal family, which was sometimes unwilling or unable to reshoulder the financial burden of her support, or to remain, often under sufferance, with her in-laws; women were considered far too dangerous and untrustworthy /p. 29 to be allowed to live alone. "It was of course the dowry that tangled the threads of a woman's fate." Theoretically, the dowry that a woman brought her husband was attached to her for life, to provide for their household during his lifetime and for her after his death. But since the potential loss if she left with her dowry threatened the economic equilibrium of her deceased husband's household, it was usually in the interests of his heirs to persuade her to remain with them. If she was over forty, the unlikelihood of finding her a new husband, due to the premium placed on virginity at marriage and the potential to produce heirs, and the difficulty of assembling dowries, discouraged her own family from intervening. Presentations to the bride from the bridegroom and his family functioned as a "counter-dowry," returning /p. 30: equilibrium to an unbalanced economy of exchange. The husband's gifts to the bride were also divided into two parts, including a cash gift corresponding symbolically to the dowry, addressed to the bride's kin, and the mancia ("tip" in modern Italian) traditionally given to proclaim the consummation of the marriage. The groom's gifts to the bride appropriately consisted of body ornaments, the sumptuous clothes and jewels --shoulder brooch, head brooch, and pendant-- displayed in portraits. "Marking" her with dresses and jewels, often bearing his crest, by bestowing on her a ritual wedding wardrobe the husband introduced his wife into his kin group and signaled the rights he had acquired over her. Most of these items remained the property of the husband, who might later bequeath them to his wife or repossess them; if he needed the capital, they could be sold. A progressive relation of the prescriptions of Florentine sumptuary laws from the beginning of the fifteenth century to the 1460s was followed in the 1470s and 1480s by a reaction --possibly to the failures of enforcement of the preceding half-century-- and many fourteenth-century limitations were restored. In the absence of any clearly explanatory evidence, one might speculate that the crackdown in the 1470s was related to a possible wish on Lorenzo [de' Medici's] part to curb competitive displays by his fellow oligarchs. In view of the claim that extravagance in female dress cut into the groom's accession of capital, the spate of bank failures that hit many upper-class families hard in the early 1470s might also be seen as relevant. Much legislation insisted on the primacy of maintaining what were seen as the traditional Florentine values on which the republic had been built, thrift and austerity, at a time of rapidly expanding consumerism. Above all, fluctuating sumptuary law parallels the constant tension between a view of women as objects of desire, which encompasses a male wish to use female bodies to display the accumulation of wealth and power, and fear, both of women and of God's wrath at excessive ostentation. Always a theme of clerical comment, by the end of the century, in a climate of increasingly intense religious observance and awareness of sin, concern about women's appearance climaxed in Savonarola's movement for the "self reform of women" and in his "bonfires of the vanities." /p. 40: While Leonardo sought to capture beauty in all its forms, Domenico Ghirlandaio, on the frescoed walls of the family chapels of the Sassetti and Tornabuoni, produced portraits of individuals embedded in the groups of kinsmen, friends, and neighbors that were their social context. See also the website that accompanies the exhibition: Virtue and Beauty.